During the debate about the benefits of video cards and processors, many people forget how important the right choice of monitor is. And in vain. After all, it is through him that we perceive game information. What to do if you missed such an important detail, and the lion’s share of funds has already been spent on iron? 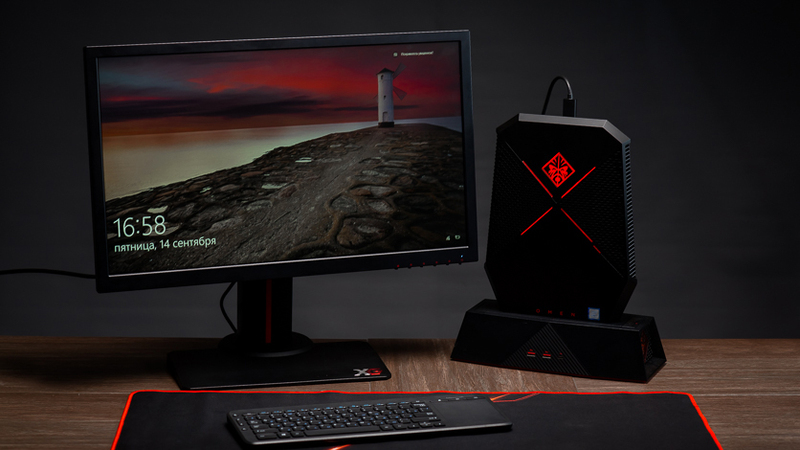 The company Viewsonic offers a compromise in the form of a model XG2402 – the youngest in the line for gamers. What will surprise this monitor, and where the savings are noticeable – find out in the review! Although 4K monitors with a diagonal of 32 inches and a sweep of 165 Hz have ceased to be a wonder, they are still not affordable for everyone. Therefore, even in eSports, medium-sized models with a resolution of Full HD are relevant, for which other indicators are at altitude – such as the screen refresh rate. It is in this category marks Viewsonic XG2402 – due to the sweep of 144 Hz and the minimum response time of 1 ms. 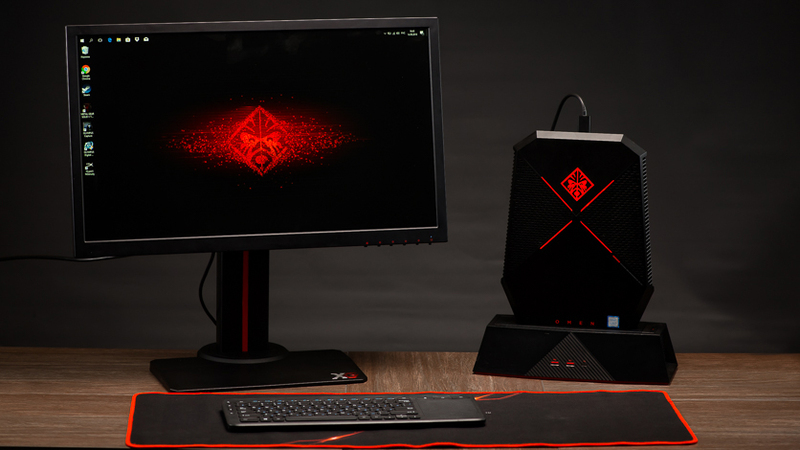 The manufacturer primarily takes into account the requests of gamers. After all, the fewer frames per second the monitor displays, the more difficult it is to notice changes in the gameplay. For a lover of online battles, low Herzka threatens to lose, and for a cyber sportsman, it is akin to a catastrophe. So the frequency of the sweep is not a whim, but a necessity, especially in dynamic actions. And it’s good when this quality complements adaptive sync. Even with performance drawdowns, it makes the gameplay smooth, with no jerks and a “jelly effect”. Do not forget about buying a device “for growth”. If the current build of the computer doesn’t draw modern games at 120 fps, it’s still useful to get a Viewsonic XG2402 level monitor. With the next upgrade, it will open up to the full extent, and you will no longer have to “buy later” a display to match the new hardware. How to understand that the monitor is gaming? Very simple. First, you should pay attention to two parameters: input lag (the delay between receiving a signal and its output to the matrix) and the speed of response (time to change the state of the matrix). For the full picture they need to be folded. If the total gap is relatively large, you won’t see victories online as your ears, because a competitor with a more powerful system will react earlier. On both points, the Viewsonic XG2402 has a full order: response time is only 1 ms, Input lag depends on the display refresh rate (at 144 Hz – 3.1-3.2 ms). 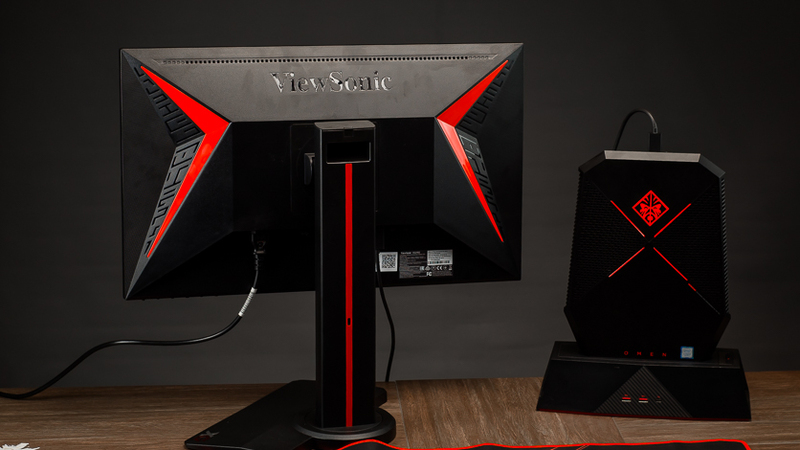 For comparison, the “office” monitors have a response of about 10-12 ms and input delays up to 50-60 ms – they are not suitable for online battles. Why? Because during the match it is important every moment. Add the response speed of the mouse and keyboard, network ping and the reaction rate of the body. Only in professionals it is up to 100 ms, and in ordinary people it is 2-3 times lower. Now you understand, for what all started? What paid for the speed? For outstanding speed characteristics, say thanks to the TN matrix. Although she also caused some shortcomings. Of course, the IPS matrix was also conquered by the 1 ms bar, but at the cost of terrifying loops behind objects and a decrease in reliability. In TN, fast response does not create problems, but the color and viewing angles are traditionally inferior to other options. That is, for editing photo XG2402 is not suitable in the best way, but he was not created for that. However, TN matrices are also different. Here is installed the panel AUO M240HW01 V80, which is well established itself. And since they are releasing it for a long time, they managed to eliminate all the “childhood diseases”. In the test monitor, uniform illumination on a white background, a matte finish successfully resists glare, and a flexible color rendering setting makes it possible to achieve a completely acceptable gamma. There is also no ShI modulation harmful to the eyes, when the screen flicker is noticeable as the brightness decreases. 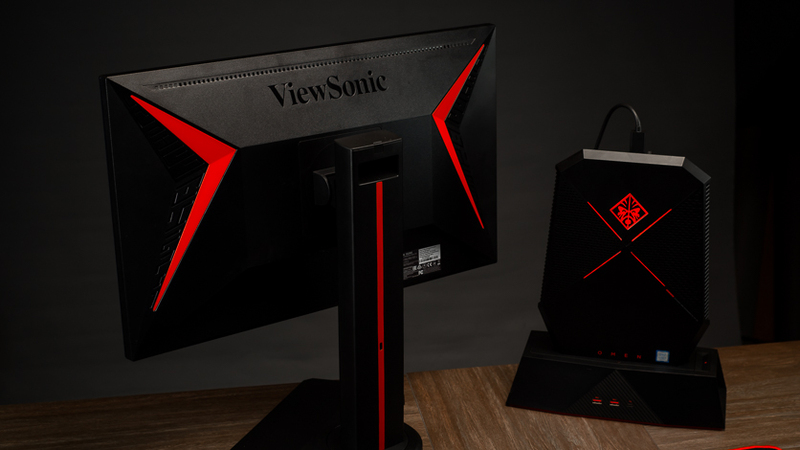 Viewsonic XG2402 supports AMD FreeSync technology. Without going into details, we note the main thing: it is responsible for synchronizing the frame shift between the monitor and the video card. In the case of a device under test, the talk is about the range from 48 Hz to 144 Hz. In other words, if fps floats within the specified limits, FreeSync eliminates gaps in images when changing frames – a problem familiar to gamers firsthand. The picture becomes smoother, and this is a pledge of game comfort. In addition, due to the constant LED backlight there is no flicker. So after a long sitting behind the screen, your eyes are less tired. Sometimes you want to unload and ears, removing at the time of the headset – in this case two speakers are built into the monitor by 2 watts. You should not expect a deep bass and expressive timbre from them, but acoustics are quite suitable for the role of a pleasant addition. Finally, the monitor was equipped with all the necessary connectors. 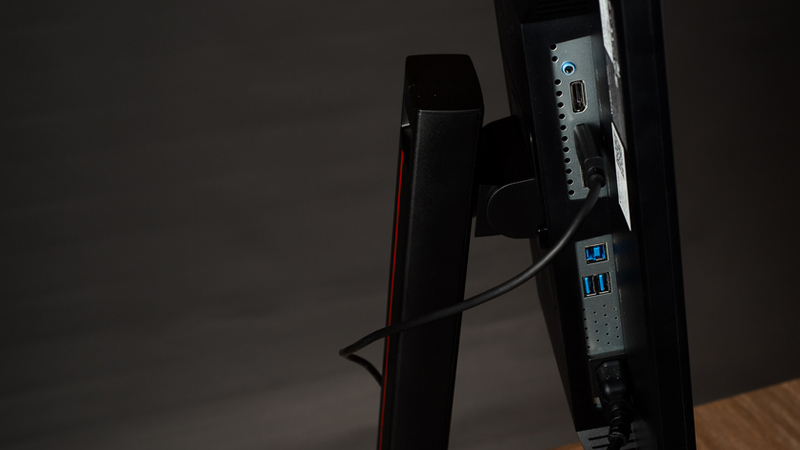 It has two HDMI 1.4 inputs, one DisplayPort 1.2 (cable included), a 3.5 mm mini jack for headphones and USB 3.0 ports (again, with the included Type-B cable). 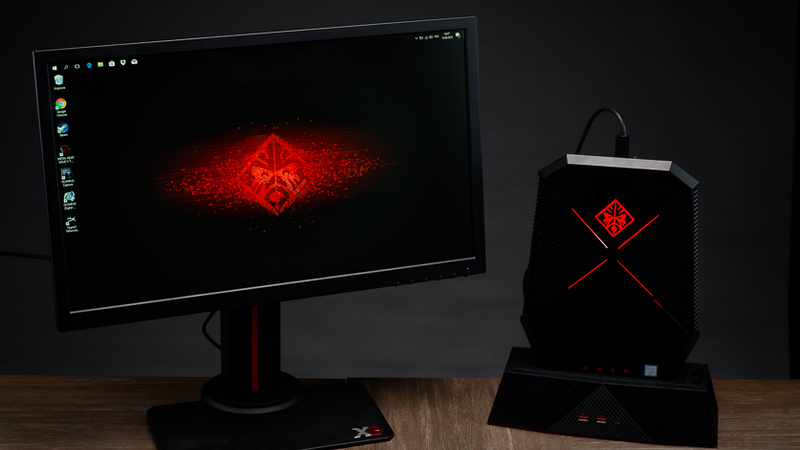 Externally, the Viewsonic XG2402 is a typical device for gamers: here you have red inserts, but aggressive lines and corners. In the dark, it looks even cooler, because the rear lights RampageX, illuminating the room scarlet. In combination with a suitable game (Vampyr or horror like Outlast 2) such a decision is especially in the subject. In pursuit of the design did not forget about ergonomics: Viewsonic XG2402 can be adjusted not only in height but also in the angle of inclination, and also rotated. 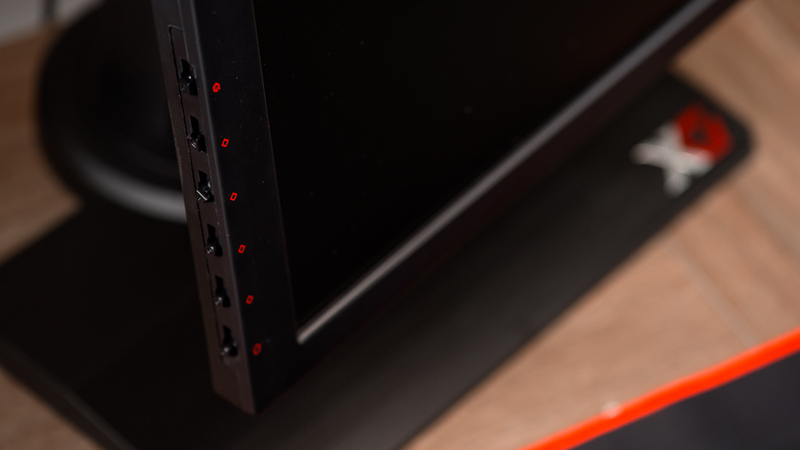 There is a cable retainer on the back of the rack, and there is a VESA mount for hanging on the wall. Because of the metal stand, the device assembled has a considerable weight, but it feels durable and reliable. This feeling is reinforced by smooth adjustments – there is practically no backlash and crunching here, common to plastic. Another tribute to simplicity and reliability is mechanical control buttons instead of a sensor. The logical solution for a game monitor. In addition, the presses are processed quickly, but the menu does not lag behind. The interface assignment with a quick selection of presets reminds of the purpose of the display – a useful option for switching between modes. Among other features – the ability to freely scale the screen, adjust color and filter the blue color to reduce eye strain. It is clear that professional gamers – those who make money on eSports – need a monitor with 144 Hz. But how useful is such a thing in a regular household? Is it useful to someone who is at the computer not only playing, but also working – and this work does not include tampering of frags or crawling in mid? Yes and no. In Divinity: Original Sin 2, RPG in the old school style, and the Portal puzzle, the increased frame rate is almost not felt and affects the gameplay a little – they are painfully unhurried. First-person shooters, especially dynamic shooters, are another matter. In DOOM, the difference between 60 and 144 frames per second is really noticeable. At first it seems that the game “accelerates”, but this is not quite so – rather, it becomes smoother, even minor movements of the hero and enemies are noticeable. After a short period of habituation, you can say for sure that the difference in the number of frames really affects the gameplay. With high frequency you have time to notice more and, accordingly, respond faster. Of course, this parameter alone will not make you a pro, but the chances of winning will increase slightly. Can such a frequency provoke nausea? During testing, this did not happen, and the dizziness that arose disappeared after changing the FOV settings and making it wider. Of course, for a leisurely digging in Excel tables, such a monitor is not necessary, all its strengths are revealed in dynamic games. I am an experienced player, owner of top iron, I tried almost everything. With high hertzovka monitors familiar for many years. And besides them, I tested various options and ways to display a picture: 4K, HDR displays, quantum dots … My opinion: 120 or higher Hz is a masthead for a fan of games with dynamic gameplay. The smoothness of the picture, the ability to be more accurate and fast. All this qualitatively affects both perception and personal gaming skills. In battles, you can reduce the detailing to medium and not pay attention to it, but a stable and high frame rate will always be with you. In any monitor, it is very important that the eyes do not get tired from the display. If the frequency of the PWM illumination is the same (multiple) hertzka – problems may arise, which especially low-cost models suffer. However, the Viewsonic XG2402 in this regard leaves a good impression: the strobe effect is absent here. As for the diagonal and the screen resolution, no 4K display will give as many sensations as will be presented with 120+ fps with adaptive synchronization. Personally, I need a monitor not only for games, but also for serious work with photos, because I myself have chosen a model with 4K resolution and HDR support, but this is a completely different price segment. If you want to play “not like before” and win more often, then the best option is to take the screen with a frequency of 144 Hz at Full HD resolution. 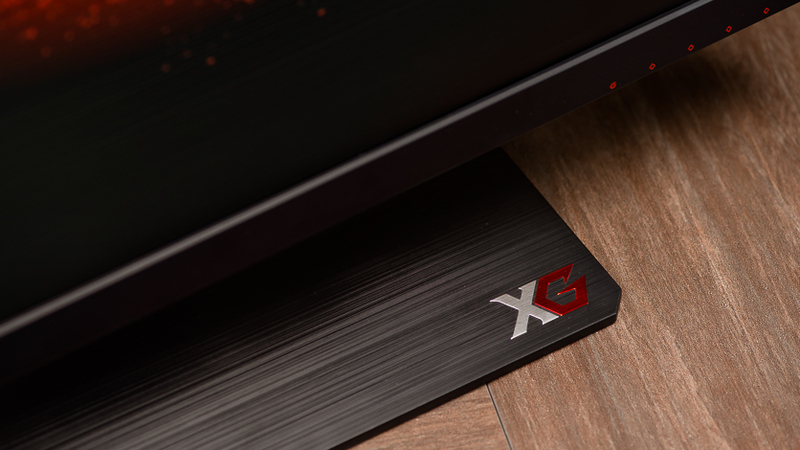 And so the model Viewsonic XG2402 will be a great pass to the world of serious gaming. 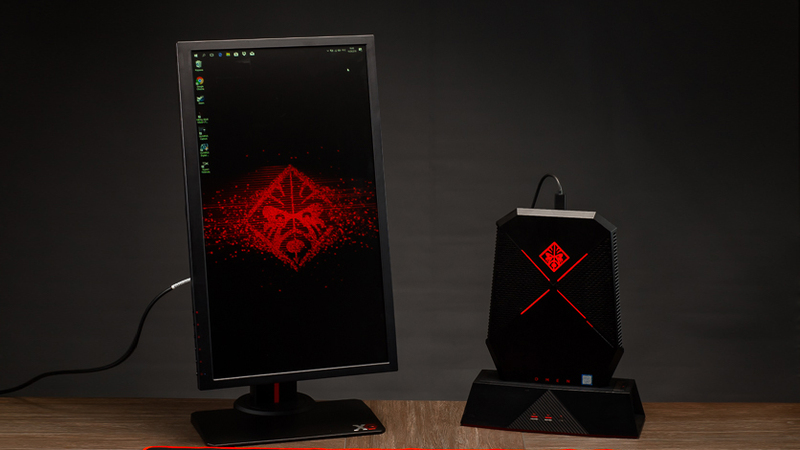 Monitor Viewsonic XG2402 can be called a basic solution for those who like to pass the evening or the other for Overwatch, and for e-sportsmen who want to raise their level. By the standards of gaming displays, this model is budget, but in terms of capabilities it is not inferior to more expensive counterparts. The refresh rate is 144 Hz and the minimum response time is what is needed so that the advanced player’s capabilities do not rest on the technical limitations of the device. Of course, the TN-matrix does not provide comparable to IPS color reproduction and viewing angles, and the sound of the built-in speakers cannot be called impressive. But this is not critical, given the positioning of the product. For complete immersion, gamers still connect the appropriate acoustics, and nuances like the depth of color are less important to them than the response time of the matrix. Viewsonic XG2402 is the best fit for those who play a lot and with taste, but do not want to give a lot of money for a game monitor.